We face economic and environmental disaster in the future if we do not address the ongoing loss of natural capital. In 2008, the global financial crisis hit the headlines almost every day, every week, for almost a year. The International Monetary Fund estimated the loss of financial capital to Wall Street and City of London firms at US$2.4 trillion. Around the same time, The Economics of Ecosystems and Biodiversity (TEEB), a global United Nations-backed study of the economics of nature, estimated the annual economic loss of the earth’s natural capital to be between US$2 trillion and US$4.5 trillion. In other words, the losses to ecosystem services each year are greater than the losses suffered through the financial crisis. However, scarcely a newspaper headline screamed this number. The question begged to be asked is: Why not? Was it because natural capital losses are losses of public wealth, and therefore less newsworthy than private wealth? Or was it because nature’s benefits are difficult to quantify and express in monetary terms, having no markets and no prices? Or perhaps it was because natural capital and its benefits—and losses—are missing from that ubiquitous measure of national economic performance, gross domestic product (GDP). GDP is the most commonly used paradigm today for measuring human progress. Virtually all economic policy is currently oriented directly or indirectly towards maximizing GDP growth. It is so deeply ingrained that people forget that it is an entirely artificial construct created in the mid-20th century as part of the war effort and Marshall Plan recovery that followed. Of course, rulers from ancient times have kept some record of economic activity for the purposes of taxation. However, national accounts as we know them were designed by economists Richard Stone and James Meade, with support from John Maynard Keynes, as a way to keep track of wartime economic activity. Given the circumstances, their framework was necessarily industrial in its essence. There was no space in it for niceties such as environmental degradation and socio-demographic developments. After the war, this framework was adapted to create the GDP number that is now used around the world. In theory, GDP is a measure of the value added by an economy in a particular year; that is, the value of all outputs after deducting the value of all inputs. A simple method, yet in practice it has proved to be a limited and often arbitrary measure for three main reasons. The first lies in the treatment of natural and environmental capital, both in depletion of natural capital (say, through mining) and in the production of environmental ills (such as pollution). For instance, if we cut down a pristine rain forest, we are clearly destroying value in terms of biodiversity, watersheds, carbon sequestration, flood control, non-timber forest produce, and so on. Yet, in the current system, this destruction of value will register as GDP growth from logging. The second major drawback of GDP is that it is an inadequate measure of human well-being. It tells us little about issues such as security, leisure, social mobility, education and health, and other facets of social capital. In some cases, this is a methodological or computational problem, as these are difficult things to quantify, but in others it can be a fundamentally conceptual problem. For instance, the overall GDP number tells us little about income distribution or how it is affecting the well-being of the people. The third major problem with GDP relates to its treatment of activities and transactions that happen outside the marketplace, both in ecological and social infrastructure. GDP ignores the work done by stay-at-home parents, including cooking, housekeeping and looking after children. There is clear value-addition from these services, but they do not enter the marketplace. Yet they would be included in national accounts if they were offered as market transactions. In this particular example, the problem is not conceptual but one of practicality (one has to draw a line somewhere). However, there are other areas where markets do not exist at all and are simply left out—in the case of carbon sequestration and other ecological services provided by a forest, for example. 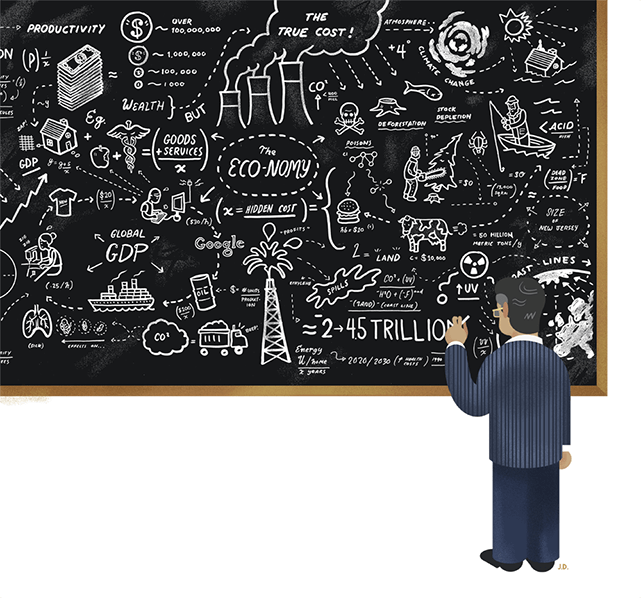 The creators of GDP thought of it as work-in-progress. Unfortunately, 60 years on, the world continues to focus its energy on maximizing an incomplete and outdated paradigm. Biodiversity, or wild nature, is the living fabric of this planet. It is the whole extent and variety of the earth’s ecosystems, the diversity and abundance of all species that inhabit them, and the number and variability of genetic material. This living fabric provides us many benefits—from food and fuel, to services such as freshwater cycling and carbon sequestration by forests; from leisure to prospecting for new medicines. But as citizens, are we sufficiently aware of our share of the free flow of nature’s goods and services to be willing to object when they are lost? The loss of a wetland or forest diminishes nature’s free public services. We certainly would not let our bank CEOs or our pension fund managers off the hook if they simply lost our deposits or lost our pensions. But how often do citizens hold businesses and governments to account for immense losses in natural capital? Our planetary home is something to which we as human beings should ascribe infinite value, but through the usual lens of economics, this value is invisible. A 50-year scenario analysis done for TEEB concluded that if we continued with business as usual, by 2050, we would lose a wilderness area roughly the size of Australia, or 7.5 million square kilometres. The lost value of this biodiversity would amount to as much as seven per cent of global GDP. The natural capital being lost, every year, was estimated at US$2.0 trillion to US$4.5 trillion. The economic invisibility of nature is one of the key drivers for nature’s destruction. But how do you start putting an economic value on what comes largely free from nature? A study done by Trucost for the United Nations Principles for Responsible Investment estimated the negative externalities (or third-party costs to society) generated by about 3,000 listed companies at close to US$2.2 trillion per annum, or one-third of their profits. This can evidently make the difference between profit and loss, but in this case they were externalities and were not accounted for. The main externalities were greenhouse gas emissions, water extraction and air pollution. We need two main transformations to make people aware of the true costs of externalities. First, we have to measure the value of these externalities, so they can be managed. Second, we have to remodel the corporations themselves, because the old ways of behaviour are not likely to survive. Change will happen; the question is how sharp, unsettling and costly to society and corporations the transition will be. Encouragingly, there is some movement in the right direction. At the 10th meeting of the Convention of Biological Diversity in October 2010 at Nagoya in Japan, President Bob Zoellick of the World Bank made a surprising and bold announcement of a project to measure and report the natural capital of countries as an addendum to their national accounts. India took the bold step of announcing that it would incorporate natural capital into its national accounts by 2015, and has since launched a national TEEB study to help. And in March 2011, a group of international experts convened by the World Bank in Washington compared experiences and ideas, and agreed to move forward to achieve this goal with a group of “first mover” nations. Still, it is remarkable how little nature is accepted today as part of economic infrastructure. Attitudes and responses change when you talk nature versus talking “man made.” For example, when one is pitching investment in a carbon capture and storage facility at a cost of only $5 billion, there’s interest until you mention that the technology is a forest. As people become more comfortable with the idea of including natural capital in economics, beginning with our national accounts, we will surely move towards a society that not only makes profit, but also lives harmoniously with nature—our most valuable and all-encompassing asset.